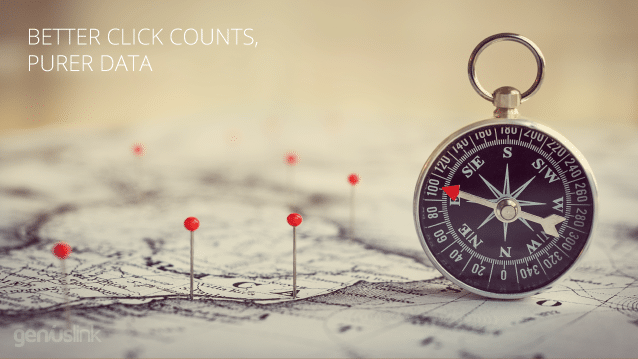 At Geniuslink, we want to be your North Star in the voyage to reconcile your analytics and we spent the better part of the last four months working on some fundamental changes to how we measure clicks. We will be improving the way we measure your traffic! Our updates went live on January 1st, 2018, we are doing a better job of identifying and filtering out “junk” traffic such as clicks from bots, duplicate clicks, and prefetch requests from apps like Facebook. Traffic was not recalculated prior to January 1st, which means traffic reports from previous months will remain the same as before. If you’ve noticed a decrease in January clicks, it is likely a result of the enhanced click filtering. This new reclassification of clicks may impact you in two different ways. Do you get clicks from social media and mobile apps? If a significant portion of your click traffic comes from, say, the Facebook app, then you’ll likely see a difference in click totals reported from Geniuslink. Click totals should be more closely aligned with reports from platforms like Facebook, Instagram, and Twitter. Invoicing Line Items and New “Junk” Clicks Item. You may notice a difference in your February 2018 invoice (for January 2018’s traffic). “Bot” clicks have always been free, but starting January 1st, 2018, bot, prefetch, and duplicate clicks will all be rolled under the umbrella of “Junk” clicks. Your invoice will include a $0 “Junk clicks” line item going forward. This means that we now give you the power to make more informed decisions by toggling between the raw total clicks and the filtered version that includes clicks coming from bot user agents, known bot IPs, prefetch headers, and duplicate clicks. Transparency has always been a cornerstone of the way we operate our business. Further, building better and more insightful reporting in order to help you be a better marketer has been a rallying cry for years. Giving you a clearer picture of visitor-driven traffic is another step in fulfilling the promise to ourselves and you, around transparency and reporting. When click totals reported by Facebook, Geniuslink, Google Analytics, Bitly, or Instagram don’t match, then who do you trust? Which source do you use to make the most critical business decisions or call a campaign a failure vs. success? At Geniuslink, we want to be your bedrock. We want to give you the analytics you can always trust. Interested to learn more about our investigation into clicks coming from Facebook? Click here to read more!